Mrs. Goins’ practice focuses on the defense of claims arising under the Longshore & Harbor Worker’s Compensation Act, the Defense Base Act, and the Texas Workers’ Compensation Act. Mrs. Goins’ prior experiences include an internship at the First District Court of Appeals of Texas and an internship at the United States District Court for the Southern District of Texas, Houston Division. While interning for the Honorable Judge Laura Carter Higley, Mrs. Goins primarily spent her time drafting memoranda for pre-submission conferences. During her internship with the Honorable United States District Judge David Hittner, Mrs. Goins focused on drafting orders and orally presenting them for approval. Additionally, she had the opportunity to observe Judge Hittner’s jury debriefings following trial. 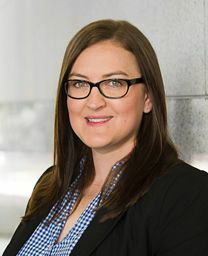 Ms. Goins received a Bachelor of Arts degree in 2006 from the University of South Florida, studied Refugee & Asylum Law and Cross Cultural Dispute Resolution at the University of Malta in 2007, and received a Juris Doctor in 2010 from South Texas College of Law. She is a Member of the Houston Bar Association. Outside the workplace, Mrs. Goins enjoys playing kickball for the Houston Sports and Social Club. Admitted to bar, 2010, Texas.